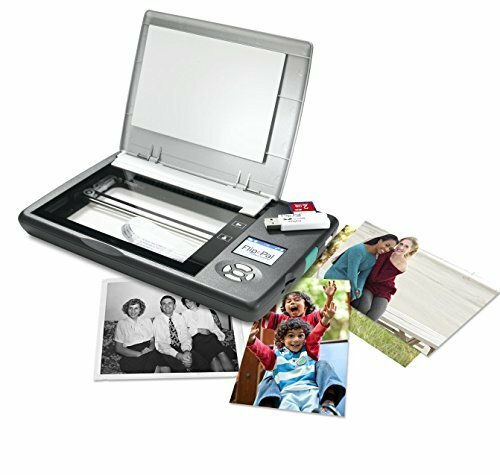 The Flip-Pal mobile scanner enables you to effortlessly collect precious photos, important documents, fragile records of personal and family history, detailed coins, jewelry, medals, hand-drawn art, and other keepsakes. Now they can be safely stored digitally rather than scattered, lost or unable to be found. Then create your story and connect with family and friends. Take advantage of the patented flip-and-scan technology to scan photos while still in the album or frame, treating fragile personal records gently. The Easy Stitch software quickly and automatically reassembles multiple scans into their larger original. Unlike alternative solutions that don't have the combination of mobility, simplicity, accuracy, versatility, and keeping the original safe, the Flip-Pal mobile scanner is compact, simple to operate, has high resolution, quick scan time, battery power, SD memory, and a computer is not required to scan. When it really matters, like your children's early years of precious memories, preparing for natural disaster, creating a high quality scrapbook, or collecting one-of-a-kind fragile documents for your family history, Flip-Pal produces the accurate image quality you will need in the future. With 600 and 300 dpi resolutions and colors and textures that are true to original, your important documents and images are safeguarded forever in digital format, protected from loss from disasters and misfortune. The Flip-Pal mobile scanner is the world's original scanner for photos, large and fragile documents, and cherished memorabilia that does not require a computer to operate. Battery powered and stores files stored on an SD card. Transform images into endearing stories. StoryScans software combines the recorded voice of the storyteller and the scan into a single file that is both small and High Definition. *Download and activation may be required. If you have any questions about this product by Flip-Pal, contact us by completing and submitting the form below. If you are looking for a specif part number, please include it with your message.